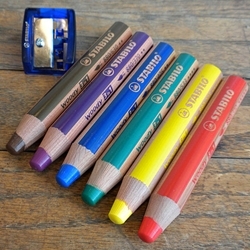 This intro set of Stabilo Woody crayons contains a terrific color palette for just about any kind of artwork. Stabilo Woody crayons mix beautifully with water to produce artwork that is a mixture of drawing and watercolor painting. This set includes 6 crayons and one crayon sharpener. Non-toxic.